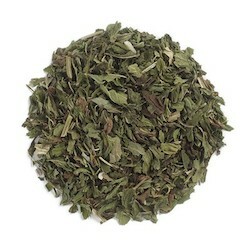 Spearmint Leaf is a parent of peppermint and one of the oldest mints cultivated.Spearmint is used in cooking, teas and herbal body care products as well as flavoring foods like jellies, jams, candies, sauces, desserts and fruit dishes. Directions: To use as a tea, pour 1 cup boiling water over 1 tsp. of herb, cover and steep 3-5 minutes.